The ad then features Steyer’s voice saying, “Terrible things happen when you leave a lawless president in power.” Then, Steyer says, “If they won’t stand up to him, they’re just as responsible as he is,” referring to Congress before including a phone number to call. The ad was paid for by Steyer’s “Need to Impeach” organization, and the Latino Victory Fund. According to Politico, the ad will cost in the seven figures range, and will air on CNN, MSNBC and on Fox during the World Cup. It will also be pushed out heavily on social media. Politico also reported that last week, Steyer donated $1 million toward legal fees around the detention center through his NextGen America group. Those opposed to Trump, including members of the Republican establishment, have attacked the commander-in-chief by comparing the temporary separation of illegal immigrant families as being “eerily reminiscent of the Japanese American internment camps of World War II” and even the Nazi Holocaust. 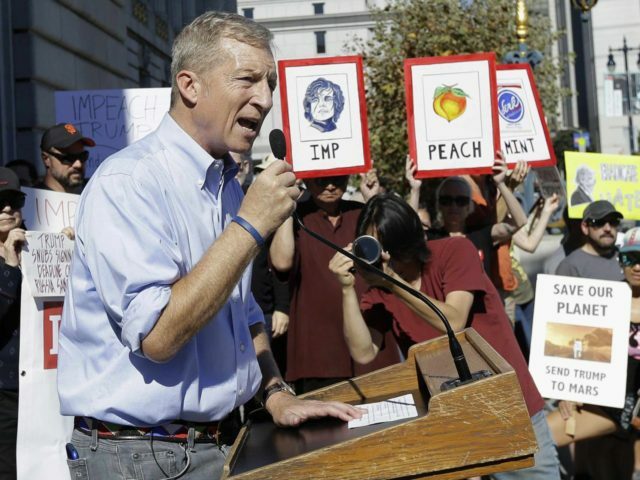 Steyer has made it his mission to see President impeached. However, some members of the Democratic Party, particularly House Minority Leader Nancy Pelosi (D-CA), have been cool toward the idea for fear of provoking a backlash from voters. In the late 1990s, Republican’s efforts to impeach President Bill Clinton were punished at the ballot box by voters who did not want to see a democratic election overturned over what many perceived as minor infractions.